You may have noticed some minor cosmetic changes to the site this morning. The menu has been reorganized and the site is more tightly integrated. But the big news today is that Advanced NFL Stats is introducing individual player stats pages. Advanced stats for quarterbacks, running backs, wide receivers, and tight ends for the last 10 seasons are now available. Just use the 'Stats' menu item to navigate to the position you want to see. Most readers will be familiar with the stats. There's Win Probability Added (WPA) and Expected Points Added (EPA), plus per play versions of both stats. The usual suspects top the lists--Manning, Brady, Faulk, Tomlinson, Moss, Gonzalez--but there are a few surprises. Drew Brees is clearly what makes the Saints go. He appears to be their physical, mental, and emotional center of gravity, so it's appropriate he is the MVP even if the numbers tell a different story. Still, it's interesting to pull the game apart and find out which players helped and hurt their team the most. Tracy Porter's interception return was obviously a crucial play. So was the onside recovery to start the half. Garrett Hartley's three long FGs made a big difference too. Joseph Addai had a surprisingly strong night. There were a number of performances worth looking at. Let's see what the Win Probability Added (WPA) numbers have to say. I’m not sure who this “Tony Dungy” character is, but he seems to think he knows a lot about the Colts. Dungy claims that it was Pierre Garcon’s dropped pass in the second quarter that turned the tide. Some people think it was the three-and-out after the Colts defense’s heroic goal-line stand. Others might point to the interception return as the pivotal event of the game. But it wasn’t Garcon’s drop. It wasn’t the three-and-out. And it wasn’t the interception. Let’s peel away all the ‘momentum’ mumbo-jumbo, and look at exactly what turned the game. In the 4th quarter with only 10 minutes left to play, Peyton Manning led an efficient drive into Saints territory. At this point the Colts were up by 1 and threatening to go up by 8. But the drive stalled, leaving a 4th and 2 at the Saints’ 46. Manning didn’t even bother checking with Caldwell. 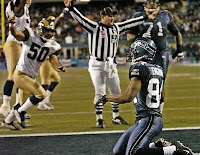 He called the team to the line and set up a great play, completing a 14-yard pass to Reggie Wayne. This was the high-water mark for Indianapolis in the 4th quarter. The Colts’ Win Probability (WP) at this point was 0.71.
Who 'Dat Gonna Kick Onside to Start the Second Half? Congratulations to the Saints and their fans for a great championship season. Head coach Sean Payton made three bold decisions on the way to New Orleans' first Super Bowl trophy. Toward the end of the 1st half, he called for run on 4th and goal from the 1. Payton decided to try on onside kick to open the second half, perhaps the game's most aggressive call. And after scoring the go-ahead touchdown in the 4th quarter, he called for the 2-point conversion. Let's take a look at all three of those decisions. Daring, yes; but did he have the numbers on his side? According to the expected points model, it's clear that a team should go for it on 4th down and goal from anywhere inside the 6. But with time running out in the 2nd quarter, it might be better to turn to Win Probability (WP). With just under 2 minutes to go and a 4th and goal on the 1, the WP analysis agrees with the go-for-it call. FGs are successful 99% of the time, and overall, a decision to kick makes the score 10-6, giving the Saints a 0.32 WP. A successful TD ties the game, giving the Saints a 0.48 WP. A failed attempt gives the Colts a 1st down at their own 1 with 1:55 to play in the half, giving the Saints a 0.26 WP. It was certainly a high-stakes play. Don't forget to check in on the win probability graph for today's game. There's a new chat/comment feature. Leave your two cents on bad decisions, blown calls, big plays, or lame commercials. It's also a good opportunity to ask questions about how the graph works. It's up and running now, available for pre-game chatter. It's going to be hard to top the last two Super Bowls. How much of a game's three hours is actual football action? David Biderman tells us, and you'll be surprised. Hat tip - PFR. Jonathan Adler of Harvard Sports Analysis finds that outlawing "the wedge" has made little to no impact on kick returns. Kurt Warner's total passing yards by season. A real roller coaster. Nothing earth-shattering here; I just love graphs. Give me the choice between a 3,000-word essay or a clear 500 x 500 pixel graph, and I'll take the graph any day. The Fantasy Football Librarian grades the fantasy ranking sites. Here's my take-away: None of these sites are any better than the others. It's luck. None of them are consistently good across multiple positions, and none of them rank near the top in multiple years. Nothing against stat-based web sites (I happen to be very fond of them), but they've all got the same fantasy information. A couple days ago, WSJ Numbers Guy Carl Bialik asked me to compare Drew Brees and Peyton Manning. I had recently looked at a comparison of Kurt Warner to other great QBs of his era, and for some reason Drew Brees hadn't crossed my mind. When I did run the career numbers for Brees, the results were surprisingly strong. 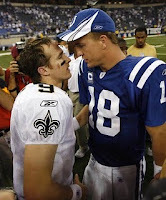 If Brees plays well and the Saints win, perhaps his name needs to be in the discussion for the Hall of Fame. Here is how the two Super Bowl QBs' careers compare in terms of Win Probability Added (WPA) since 2000. This includes playoffs and Super Bowls. Tiki Barber recently called Adrian Peterson "a liability for his team" due to his propensity to fumble. Is that assessment fair? What if Peterson's fumbles really did hurt his team more than his overall performance helps? Peterson himself admits he has a fumble problem, and he's promised to work on it in the off-season. 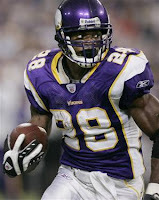 How many fumbles is too many when it comes to a break-away home-run hitter like Peterson? I'll look at Peterson's fumbles in three contexts. First, I'll look at his rumble rate, which accounts for how often he's asked to carry the ball. Second, I'll look at how costly his fumbles have been in terms of Win Probability Added (WPA). And third, I'll look at his fumbles in terms of Expected Points Added (EPA), which is less sensitive to game situation as WPA. Aside from his recent fumble problems in the NFC Championship Game, Peterson has committed 4, 9, and 7 regular season fumbles over his three-year career. That's certainly more fumbles than you'd like to see, but keep in mind how often he's asked to carry the ball. Any fumble is equally likely as any other to result in a turnover or recovery, so I'll start by looking at fumbles rather than fumbles lost. Further, fumble rate is going to tell us more than total fumbles about a player's proclivity to lose the ball. For RBs, especially guys who get a lot of receptions, it makes sense to consider their total touches, which includes carries and receptions. Note: You may have already read some of this in my contribution to Peter King's Monday Morning Quarterback column this morning. You can hear Dan Patrick and Peter King talk about the topic at this link (about 25 min into the 40-minute clip). In 96 of the 158 OTs, or 61%, the coin flip winner won the game. In 58 of the 158 OTs, or 37%, the coin flip winner won on their first possession while the loser never touched the ball. This includes 2 of the last 3 OT games in the playoffs. Don’t be fooled by other numbers. In 2009 there happened to be only 13 OT games, and the coin flip winner won 7 (54%). In 6 of the 13 (46%), the loser never touched the ball. The sample size for any single year is too small for a reasonable estimate of the true numbers.